Sometimes, I hesitate to share a recipe because it seems almost too simple, too basic. And – it’s suitable for any season. I find myself making it in the Summer because it’s super-fast and requires minimal time standing in a hot kitchen. Plus it’s a great partner to any fresh summer veggies or sides I may have on hand – Fresh sliced tomato? Yellow squash or zucchini? Chilled couscous or quinoa salad? In Autumn and Winter, I like it as a main, with warm, crusty, “buttery” bread and a fresh, juicy apple or Clementine for dessert. I will warn, however, that when you have a simple recipe like this, you need top-quality ingredients. Use a good quality extra virgin olive oil and balsamic vinegar – don’t try to substitute canola oil and apple cider vinegar. Use fresh garlic, not garlic powder. Use white beans – cannelleni or Great Northern – don’t try to sub red kidney beans, black beans, or pinto beans. 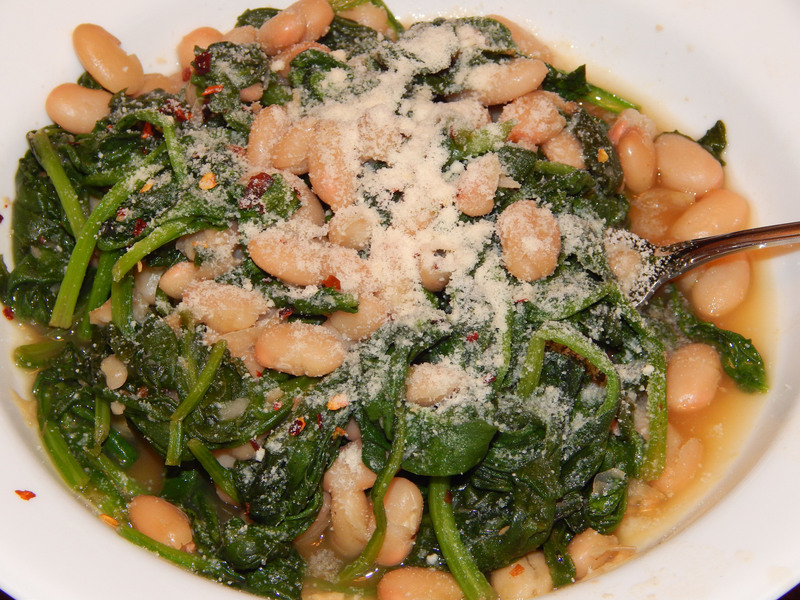 White beans have a mildness of flavor and seductive creaminess that pairs with spinach almost magically. Finally, the vegan Parmesan cheese or nutritional yeast is entirely optional, but DON’T skip that final drizzle of balsamic vinegar. Heat the olive oil over medium-high heat. 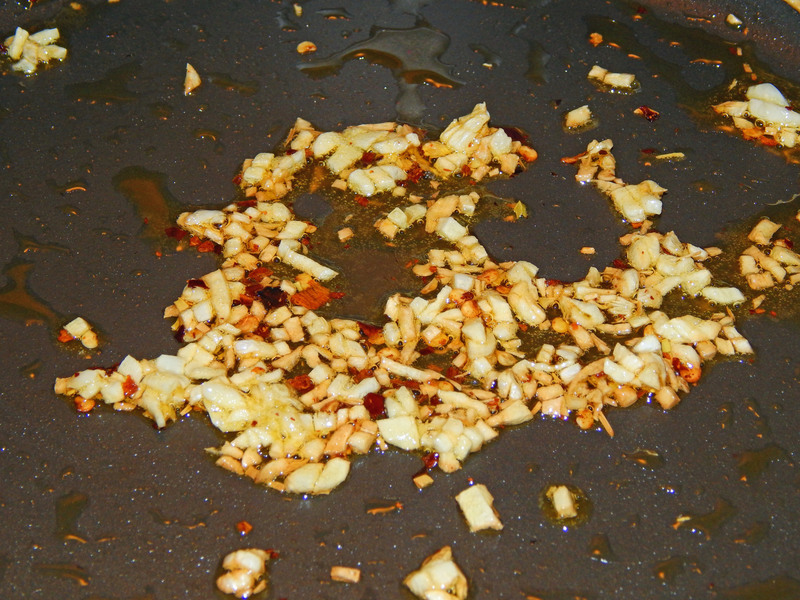 Add the garlic and red pepper flakes; saute for about 2 minutes, or until garlic is golden. Once you’re able to fit all the spinach in the pan (this should only take a few minutes), add no more than 1/8 cup water and 2 teaspoons balsalmic vinegar. Add the beans. Stir to mix, then cook for about 2 minutes, until the beans are heated through and all the spinach is wilted but still bright green. Scoop into bowls and drizzle with balsamic vinaigrette. Those who like it hot can add an extra sprinkle of red pepper flakes. Optional – Top with vegan Parmesan Cheese (I like the GoVeggie brand!) or nutritional yeast. 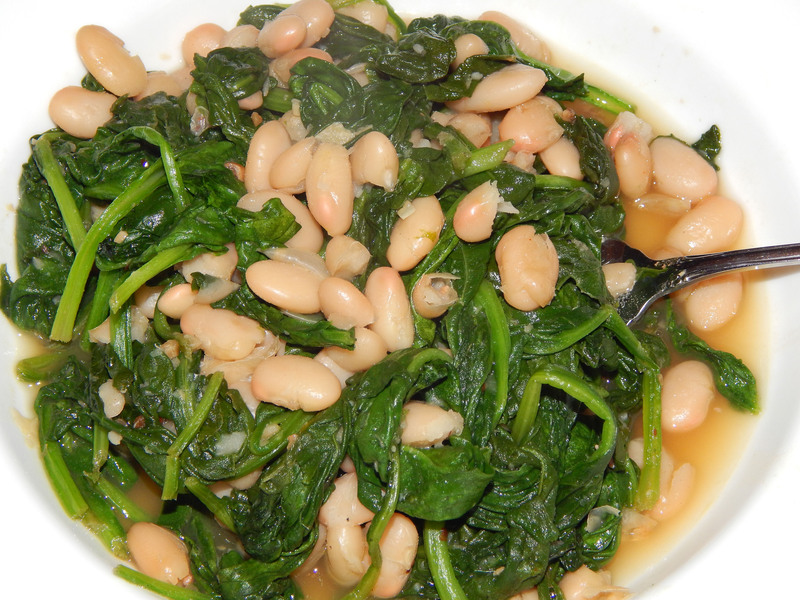 Frugal vegans can also use frozen spinach instead of fresh – especially if feeding a crowd! It doesn’t taste quite as good as fresh but it’s much more economical and goes a long way towards “stretching” your meal. Thaw in the microwave first and drain the extra liquid before adding to the pan. You can also use other greens – escarole, chard. I would advise staying away from stronger tasting greens such as collards, mustard, or turnip greens. I personally prefer spinach because the taste is mild, it cooks quickly, and is readily available at most groceries throughout the year. Escarole would be my second choice, because it can be harder to find and a tad more expensive. I’ve seen similar recipes that call for using a cup or more of vegetable broth. WHAT? You don’t need extra flavor (what with the garlic, red peppers, and balsamic vinegar). 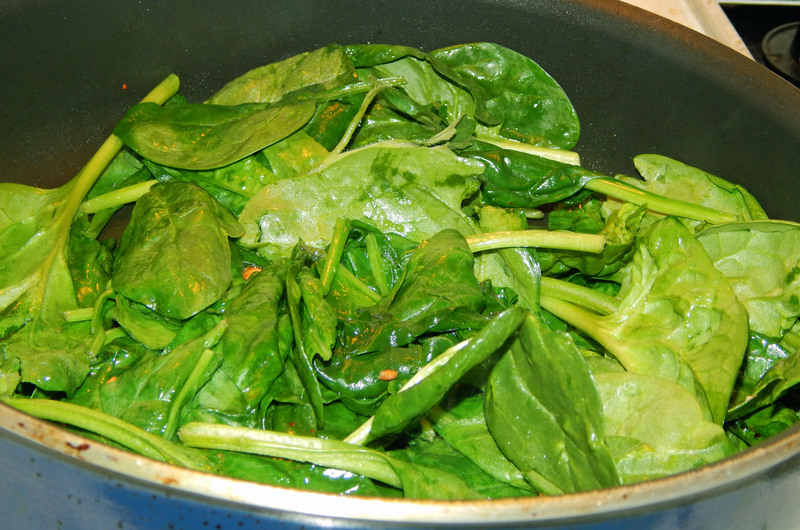 And spinach releases a great deal of water as it steams, so you only need to add enough liquid to keep your spinach from burning. The goal is to wind up with beans and greens, not soup.